This article was originally published over at Startup Rocket here, and written by Will Little and Troy Henikoff. But first, in your downloaded model, take a look at the rest of the cells down column C to see how the numbers are calculated from the assumption values. While explaining the details of each formula is beyond the scope of this article, it’s helpful to Google for terms like Inventory Days on Hand and Accounts Receivable Days if you are unfamiliar with them and how they are used to calculate the applicable cells on your balance sheet. While we left these two assumptions at 30 days for our example model for teaching purposes, take a look at what happens to your balance sheet when you drop the Accounts Receivable Days to 3, which may be more realistic for an eCommerce business with credit card payments and relatively low transaction values. With our assumed 4% churn percentage, this means we can model that our average customer stays with us 25 months. Multiple these 25 months by the Gross Profit per subscription (which is also an assumption value) and that leads to our projected LTV of $213.59. 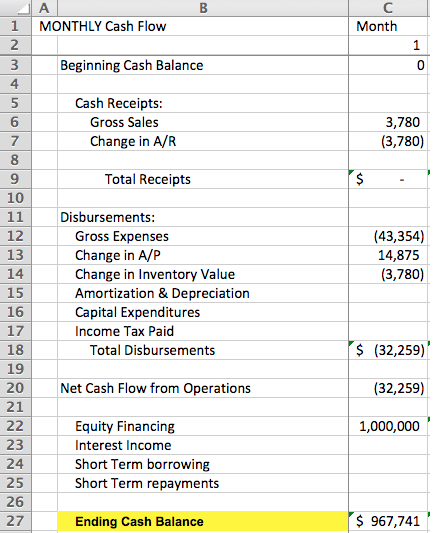 Finally, to give you, your team, and your investors a helpful glance at what your projected five years look like, create separate tabs called “Annual Income Statement”, “Annual Balance Sheet”, and “Annual Cash Flow” and use formulas like “=SUM(‘Monthly Income Statement’!C4:N4)” to roll up 12 months worth of values from your monthly tabs. Practically, be sure to keep a copy of your original model for reference. Then, after you’ve reconciled your books every month, open up your “active” financial model and (1) tweak the assumptions to get the current month close to actual, then (2) plug in the actual numbers in your monthly statements (i.e. replacing the formulas from your assumption values, which will remain in place for future months and now be more accurate). As a homework assignment, for those interested, see if you can add an assumption value called “Maximum marketing spend of Cash Balance” and model in this throttle to avoid burning through too much cash. This is an example of the types of custom features you can add into your own model.